Employees in Google offices around the world staged a walkout on Thursday to protest the company’s handling of senior executives accused of sexual misconduct. The demonstration was scheduled by organizers to begin at 11:10 a.m. local time for each office, with a Twitter account set up by protest organizers featuring walkout photos from Singapore, Tokyo, London, Dublin and other locations. The walkout was organized in response to a report by The New York Times last week that found two senior Google executives had been paid tens of millions of dollars in exit packages despite being accused of sexual misconduct. A third senior executive named in the Times article had been allowed to stay at the company but resigned on Tuesday. In New York, Google employees streamed out of the company’s office in the Chelsea neighborhood of Manhattan and walked to Hudson River Park, many carrying signs pointing to the company’s payouts and still wearing their Google employee badges and company gear. Elissa Brown, a Google employee in New York, said she was surprised by how many staffers participated in the walkout and believed the company was listening. Brown said she did not believe issues with how companies handle sexual misconduct were particular to Google. In San Francisco, Google employees nearly filled a plaza named for Harry Bridges, a 20th Century immigrant and union organizer. 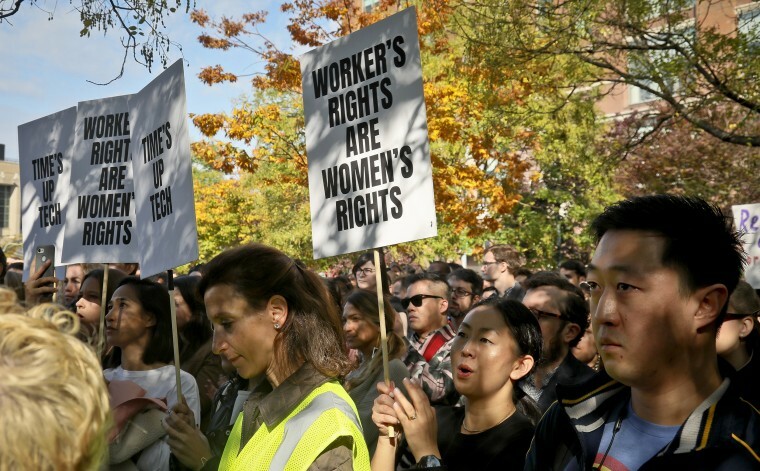 Organizers used a bullhorn to lead chants such as “women’s rights are workers’ rights.” They also read aloud reports of discrimination and harassment from their workplaces, including one report that said a manager wasn’t punished after telling two employees that he’d like to see them make out. The event lasted about 15 minutes. Employees told NBC News that the company largely left it up to line managers how to handle the employees walking out. Some managers declined to cancel meetings scheduled for that time, while others told their employees that they could take the rest of the day off. A speaker at the event advised people to return to work in groups so that they couldn’t be singled out. Eric Kustarz, a manager for one of Google’s engineering teams, said he decided to walk out because he was concerned about female employees. “I believe in fighting for women’s rights. It’s nice to see a giant corporation trying to make societal change,” he said. Kustarz, who manages seven people, said he didn’t pressure his team either way on whether to attend. “I told them that I was going, but that that should not make them feel they should feel obligated to go,” he said. Christian Boyd, 22, a marketer at Google, said she walked out because she wanted to see the company not repeat its multimillion-dollar exit packages for accused harassers. “We need change, and often it’s not until something is forced in front of you that change happens,” she said. She said she also wanted to make sure that black women like her were represented among Google employees’ voices. “We’re the most underrepresented group at Google,” she said. The Times report drew a swift response from Sundar Pichai, Google’s chief executive. That same day, Pichai and Eileen Naughton, the company’s vice president of people operations, sent an email to employees saying that the company was “dead serious” about making sure the company provides “a safe and inclusive workplace.” Pichai and Naughton said that the company had fired 48 people without pay for sexual misconduct over the past two years. Pichai also supported the employees’ protest. Pichai’s support did little to quell growing employee resentment. “Hundreds of people are demanding structural change, not just inclusive sounding PR,” tweeted Meredith Whittaker on Tuesday, confirming that employees were planning a walkout. The Times reported on Wednesday that protest organizers expected more than 1,500 employees to participate in the walkout. A Twitter account, @GoogleWalkout, said that employees were demanding five changes: an end to forced arbitration on cases of harassment and discrimination; a commitment to end pay and opportunity inequity; a publicly disclosed sexual harassment transparency report; a new process for reporting sexual misconduct; and elevating the company’s chief diversity officer to report to the company’s CEO and have that officer make recommendations to the company’s board of directors. The group that organized the protest also called for an employee representative to be added to the company’s board. In London, Google employees said on Twitter that weather forced employees to remain inside, but that people filled the biggest room in the office with more in overflow areas. Marc Cohen, an employee in Google’s London office, said he was participating to send a message to the company’s leadership. “I’m disappointed by some of the things I’ve been reading about and hearing about how complaints have been handled by Google, and I wanted to share my support for people who have to deal with those kind of situations and also as a sign for my own personal dissatisfaction for how Google has handled some of these situations in the past,” Cohen said. Sam Dutton, who also works in Google’s London office, said he hoped the walkout would inspire change within Google as well as other companies. “I think there is a change in mood across the world in many different companies, and I hope this will have a positive effect,” Dutton said.